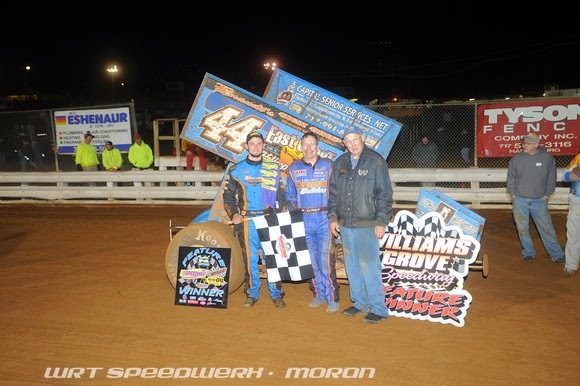 Mechanicsburg – Rodney Westhafer of Mechanicsburg out raced Lucas Wolfe to win Friday night’s 25-lap 410 sprint car feature at Williams Grove Speedway while in the 358 sprint main Adrian Shaffer pulled a last lap pass on Phil Walter to take the victory. Westhafer started second in the field with Wolfe on the Pole and as it would turn out, Westhafer would lead the entire way for the win, the second of his career at the oval. The leaders entered the rear of the field with nine laps completed and at that time Wolfe was applying heavy pressure to Westhafer for the lead as Austin Hogue, Glenndon Forsythe and Aaron Ott stayed within striking distance. 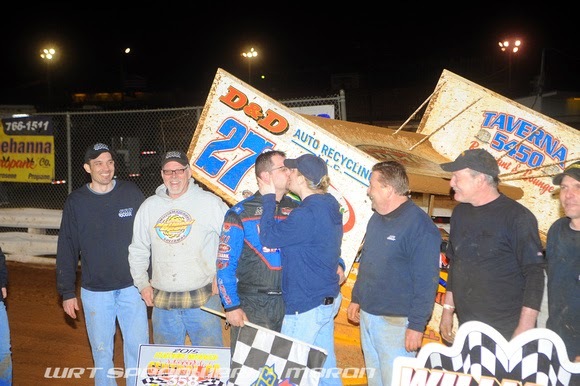 But Westhafer, wrenched by Dave Brown Sr. this season and an understudy of Williams Grove veteran Don Kreitz Jr., was fully capable of fending off Wolfe’s tests in traffic. The pace was hectic on a tacky and tricky surface and Westhafer was relieved to see the races only caution flag unfurl with seven laps to go, clearing his way from traffic. And when action resumed, Westhafer pulled away on the open track to a convincing win over Wolfe aboard the Allebach No. 5W. Heats went to Don Kreitz Jr. and Wolfe. Walter and Kody Lehman held the front row for the start of the 358 sprint main and Walter took control at the start as fourth starter Adrian Shaffer zoomed into second. Walter was up to the challenges of Shaffer on restarts of laps four and eight but when the final 12 laps went non-stop and the leader entered traffic the pressure took on a different tone. On the fast surface, any cars were hard to pass including those at the rear of the field and when Watler got caught up behind traffic on the final lap, Shaffer capitalized in the second turn to take the victory. The win was 10th of Shaffer’s career at the oval. Walter settled for second followed by Kevin Nouse, Kody Lehman and Bill Stine. Sixth through 10th went to Doug Hammaker, Rich Eichelberger, Scott Fisher, Brad McClelland and Chandler Leiby. Heats went to Fisher, Lehman and Shaffer.